Lake Tahoe - The Jewel of California and Nevada! Eagle Falls on the Eagle Falls Trail. 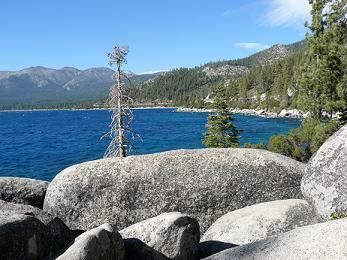 While on your Truckee Vacation, a "Must Do and See" is driving over to nearby Lake Tahoe. From Truckee, there are two ways to get to the Lake. You can view the routes below on my Lake Tahoe Map where eventually I'll have a link to all of the Lake Tahoe Cities and Towns! From Central Truckee, take Hwy 89 to Tahoe. This will parallel the Truckee River which originates from Tahoe City on the Lake, and you will also pass by Squaw Valley, in Olympic Valley. You will end up at Tahoe City, where you can go south towards Emerald Bay which is the most photographed spot at the Lake. 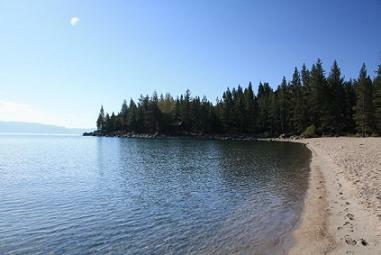 From Tahoe City, if you go north, you wind through Tahoe City, then on to Kings Beach, and Incline Village. There are tons of great beaches and restaurants and fun shops, to stop at along the way! From Downtown Truckee, you can take Hwy 267 past Martis Valley, and Northstar and over to Tahoe. This puts you in Kings Beach, which is a fun town on the Lake. 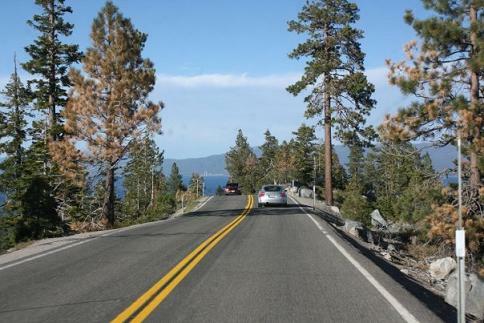 Driving around the Lake - You can make a fun day of this, by stopping at all of the towns along the way, and checking out the beaches, and stopping in at some of the Casino's in South Lake Tahoe, where the buffet's are awesome! It is 72 miles around the lake, and it is considered one of the most beautiful drives in America. The picture below was taken from Hwy 89 after heading around Emerald Bay towards South Tahoe. This section of the road always freaks me out to drive, because it seems like the road is just there with a drop off on either side, and then you start into some very steep hairpin turns down the hill. The views are incredible from the top! 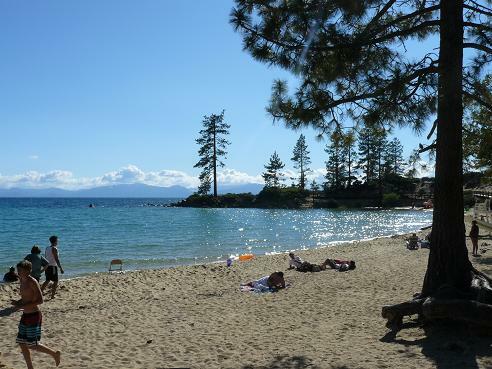 Going to my favorite Tahoe Beach, at Sand Harbor State Park on Hwy 28, 2.5 miles south of Incline Village on the Nevada side of the lake. 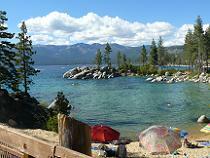 See my list of the Tahoe Beaches that the Truckee Travel Guide will be covering. For a great lunch or dinner, check out my Favorites, Sunnyside Inn, (just south of Tahoe City on the water), or Jake's on the Lake, in Tahoe City. It is just so relaxing to sit on the decks on the Lake, and just enjoy the scenery over a meal, and a glass of wine. Spend the day hiking the Vikingsholm Trail, at Emerald Bay, down to the Beach and Vikingsholm Castle. 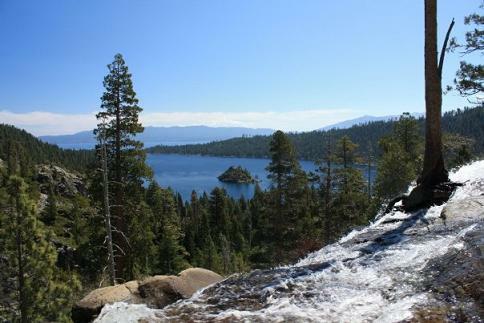 (pictured above) Then follow the Eagle Falls Trail up to Eagles Falls, for an unbelievable view of the Lake and Emerald Bay. Another great short hike in the area with a waterfall and amazing views is the Cascade Creek Falls Trail. Be sure to pick up some Tahoe Hiking Maps before you start your trip! Check out my Hiking Page, for other great hikes and watch some of my videos. 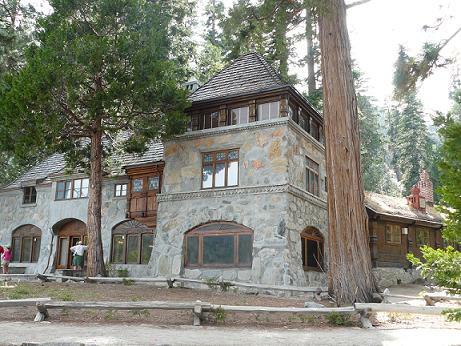 Check out some of the other Lake Tahoe Museums! Ride the tram up the mountain at Heavenly and hike the trails, or have lunch while enjoying the incredible view of the Lake. Biking or walking along the lake - The lake has bike trails around a good portion of the way, and is a great way to see the Lake close up. 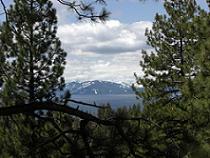 Tahoe has some fantastic world class Ski Resorts to enjoy in the winter, with stunning views of the Lake. 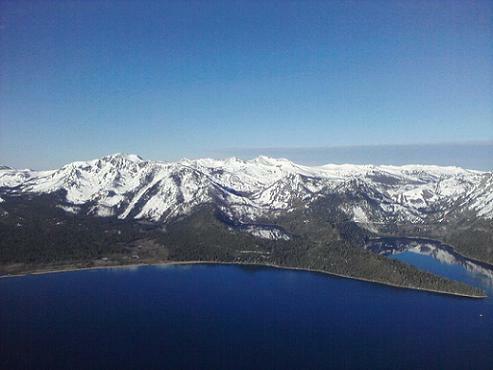 Take one of the great Lake Tahoe Helicopter Tours from the Truckee-Tahoe Airport with Sierra Air Helicopters, or can also fly out of South Lake Tahoe with Reno-Tahoe Helicopters. If you are bold enough, you can go Heli Skydiving with them, or Heli Skiing! and....if I wasn't so deathly afraid of heights, I would want to go Hot Air Ballooning over Lake Tahoe for the spectacular views and photo opportunities! Fortunately, one of my daughter Brie's friends,Tiffany Watts did, and shared some of her photo's, including the one below! The video below, shows Mike Wilson who does some Quadruple Backflips from a rope swing 99 Feet above Lake Tahoe. He also made a video doing Triple backflips into the Truckee River that is awesome! Mike also does these flips on ski's. I've got some of his ski video's coming soon. I have one video of his where he had a bad crash after doing a ski jump and flips, on my Ski Fail Videos page. It is the second deepest lake in the United States at 1,645 feet deep, following after Crater Lake in Oregon. The sun shines at the Lake approximately 75% of the time, or 274 days. There are 63 tributaries draining into Tahoe with only one outlet at the Truckee River in Tahoe City. At lake level, annual snowfall averages 125 inches. At alpine skiing elevations, the snowfall averages 600 inches per year. At the surface, the water temperature varies from 41 to 68 degrees F. Below a depth of 600 to 700 ft, the water remains a constant 39 degrees. 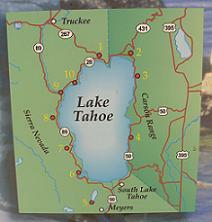 Lake Tahoe Map - includes links to the Cities/Towns around the Lake, as well as the State Parks. 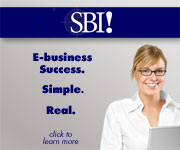 Lake Tahoe Non Profit Organizations - includes Mission Statements and links to the Non Profits websites. 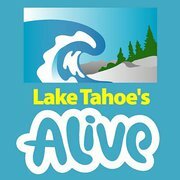 On Facebook - Jane from Lake Tahoe's Alive. She travels around the lake on a regular basis, and posts frequently every day. 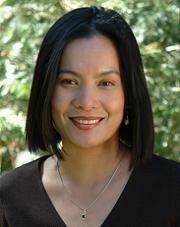 She has some great photo's and information about different Tahoe events, activities, and restaurants etc. I've been following a lot of different Tahoe Facebook sites, and I enjoy hers the best!